How comfortable would you be, having an exquisite, delicious meal midair New Zealand? 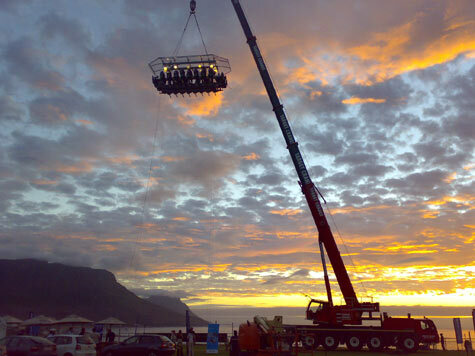 “Dinner in the Sky is a hosted dining table, suspended at a height of 50 metres by a team of professionals”. New Zealand’s cuisine is largely driven by local ingredients and seasonal variations. An island nation with a primarily agricultural economy, New Zealand yields produce from land and sea. Similar to the cuisine of Australia, the cuisine of New Zealand is a diverse British-based cuisine, with Mediterranean and Pacific Rim influences as the country becomes more cosmopolitan. 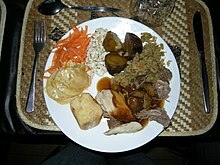 In New Zealand households, dinner is the main meal of the day, when families gather and share their evening together. Restaurants and takeaways provide an increasing proportion of the diet. When the indigenous Māori arrived in New Zealand from tropical Polynesia they had a number of food plants, including kūmara (sweet potato), taro and tī. The plants grew well only in the north of the North Island. Native New Zealand plants such as fernroot became a more important part of the diet, along with insects such as the huhu grub. Problems with horticulture were made up for by an abundance of bird and marine life. The large flightless moa were soon hunted to extinction. Rāhui (resource restrictions) included forbidding the hunting of certain species in particular places or at certain times of year, so that the numbers could regenerate. 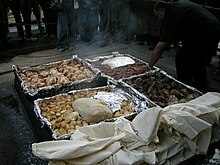 Like other Polynesian people, Māori cooked food in earth ovens, known in New Zealand as hāngi, although the word umu is also used as in other Pacific languages. Stones are heated by fire and food packed in leaves are placed on top. The packs are further covered with foliage and cloth, or, wet sacks, then earth. Other cooking methods included roasting and, in geothermal areas, boiling or steaming using natural hot springs and pools. Occasionally food would be boiled in non-geothermal areas by putting hot stones into a bowl with water and the food; and some food was also cooked over the open fire. Some foods were preserved using smoke, air-drying, or layers of fat—particularly muttonbirds. Māori were one of the few people to have no form of alcoholic beverage. The Soul Survivors were an American, Philadelphia-based R&B group, founded by New York natives Richie and Charlie Ingui and Kenny Jeremiah, known for their 1967 hit single “Expressway to Your Heart“, which was the first hit by Philadelphia soul record producers and songwriters Kenny Gamble and Leon Huff. The Soul Survivors first played together in New York under the name The Dedications, founded by member Kenny Jeremiah, who released several singles under this name in 1962 and 1964. They adopted the name Soul Survivors in 1965. They signed to Philadelphia label Crimson Records, who put them in touch with Gamble & Huff. “Expressway to Your Heart” was a #1 hit regionally in Philadelphia and New York in the fall of 1967, and the tune reached #4 on the Billboard Hot 100 nationally. “Expressway to Your Heart” spent 15 weeks in the charts and sold over one million copies. 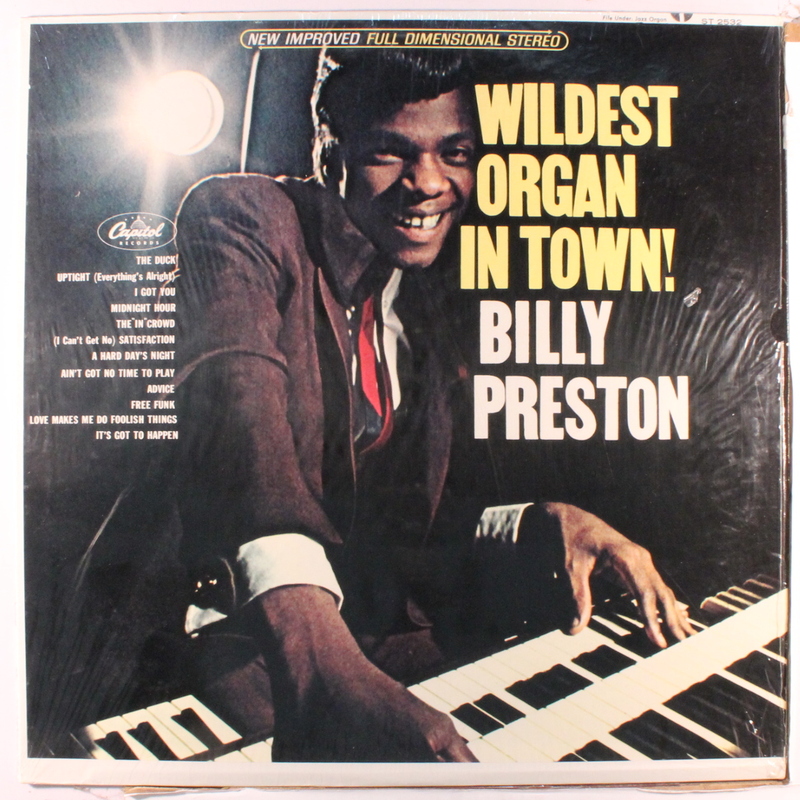 The follow-up was “Explosion in Your Soul,” which was not as successful (U.S. #33); a third release, “Impossible Mission”, also was a minor hit in 1969 (U.S. #68). They quit playing for a few years, but re-formed with a different lineup in 1972. They had one more hit, “City of Brotherly Love” in 1974. In the 1970s, the group lost its record contract and its manager and eventually disbanded. Charlie Ingui became a landscaper, Richie Ingui became a house painter, Paul Venturini became a restaurateur, and drummer Joe Forgione owned an auto body shop. In 1987, the Inqui brothers began playing occasional gigs as the original Soul Survivors and signed a five-record contract in 1991 with Society Hill Records. As of 2006, they were playing occasional dates in the Eastern United States. Chuck Trois also went on to release a solo 45 rpm single on A&M Records in August 1969, with “Mr. Holmes” on one side, and “A National Band” on the other. Found out about another woman. “I started seeing a guy after meeting him at a charity event. Two weeks in, he calls me and says that he doesn’t want to be in a relationship because he’s going to be moving back to his parents in Dubai in a few months time. I asked him if he maybe wanted to try it out and see how the distance worked out for us. If it was too much, we could still be friends. He agreed. “A few weeks after moving back to Dubai (we had been dating for eight months at this point), he and I are on Skype. He says, ‘I haven’t been entirely truthful. I told you the last girl I dated was five years ago but that’s not true. There was someone after that as well.’ This got my thinking really hard and all I asked after that was if she’s still in the picture. And if so, in what capacity. He said (I kid you not), ‘She’s still my girlfriend.’ I was the ‘other woman’ and I DIDN’T EVEN KNOW. “Here’s where it gets good. I reached out to his girlfriend via Facebook, sent her my number, and asked her to give me a call. She called me later that night and I told her everything, along with apologising for not having heeded the red flags. She was understanding of that fact that we were both blindsided. He later told me that my telling her everything had ‘ruined the sanctity’ of their relationship. ​”Conga” is the first hit single released by the American band Miami Sound Machine led by Gloria Estefan on their second English-language album, and ninth overall, Primitive Love. The song was written by the band’s drummer and lead songwriter Enrique Garcia. The single was first released in 1985. According to Gloria Estefan in an interview in the Netherlands television show RTL Late Night, Conga was written after the band had performed “Dr. Beat” in a club called Cartouche in Utrecht, the Netherlands. The single was released in 1985 (see 1985 in music) and became a worldwide hit, reaching #10 on the U.S. Billboard Hot 100 and winning the Grand Prize at the 15th annual “Tokyo Music Festival” in Japan. The single was certified Gold by the RIAA in the U.S. for shipments of 500,000 copies.